Minuteman Landscaping provides safe and effective organic plant health care solutions for the trees and shrubs on your property with a focus on improving soils through the application of organic fertilizers, compost, compost teas, biostimulants and humates. In addition, we protect your trees and shrubs by monitoring and applying the correct organic solutions for plant pests such as spider mite, whooley adelgid, mealy bug, azalea bark scale, taxus vine weevil, winter moth and others. Our experienced crew will recommend treatment only when completely necessary in order to protect the plants in your gardens. A proactive approach is vital to protect your valuable investment. Our solutions include a late fall anti-desiccant spray to help protect shrubs from damaging winter winds, removing excess mulch to keep root systems from being deprived of water and air and a solid pruning program to help keep plants healthy and sustainable to insure proper sunlight and air circulation. As with all our other services our plant health care division is working with the natural system in place and is a vital part of our effort to serve our clients in the most complete way possible. People are not sure what it is. You might have seen them – tiny green inchworms crawling on oaks, maples, and fruit trees. You might have noticed more caterpillars around or more moths flying around. You may not know what it is but you know something is wrong, especially when the leaves on your crab apple look like Swiss cheese! 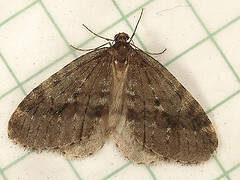 For the past several years, many communities have reported large populations of moths emerging around Thanksgiving and continuing through December. In the spring, there has also been an astounding number of caterpillars defoliating deciduous trees. The damage that winter moth can cause is tremendous. Many different deciduous plants are susceptible including maples, white elm, cherries, oaks, crab apples, apple and certain spruces. The tiny caterpillars get inside the buds of these trees and start to feed. When the weather is cool and bud opening is delayed, these larvae feed and feed and then move from bud to bud resulting in bud death. 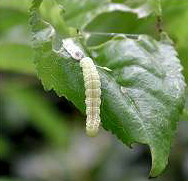 As the larvae grows, they begin to feed on expanding leaf clusters and can defoliate in extremely high numbers. To protect your valuable trees, we recommend treating for winter moth in the later winter to early spring. It is imperative to address this problem before there is irreparable damage. Winter moth will migrate from bud to bud and repeat their destructive process. Our programs can help prevent this damage to your trees. Contact us for more information using the form below. A proactive approach to protect your investment is an important element to consider. We offer several important services that work to keep your plants healthy including our fall Antidescicant spraying which seals and protects susceptible plants from drying out in the winter. We recommend removing excess mulch to avoid denying root systems of vital water and air. In addition, we recommend pruning to insure that the trees and shrubs are receiving the necessary sunlight and air circulation. Our Plant Health Care division is working with the natural systems in place and since we are on your property on a regular basis, we are best able to prevent, detect and resolve problems before they cause serious damage. Let us help you attain a healthy landscape without the harmful chemicals. Contact us today to get more information. Just a short note to thank you for all the help with our rather difficult retaining wall project. I can't imagine the outcome without you there to direct each phase. It was truly a pleasure working with you, your mason and all the people involved with the landscaping and large tree planting. Thank you also for the many years of incredible service you have provided us with; from lawn and plant care to the tick and mosquito program. We are truly fortunate to have found you!